Just watched Tomorrowland a second time, and it still made be cry. Such a great sentiment—all I needed to pick me up from this election. Wow probably should have watched Tomorrowland before the election. Alguém pode, por favor, desligar a máquina de Tomorrowland? Trump eleito, Temer presidente... não tem outra explicação pra tudo isso. 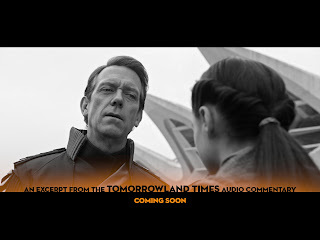 This election makes me think of the Hugh Laurie villain in #Tomorrowland. I agreed with him then but now I think he was right. Nix considers himself a member of Plus Ultra in the same way that Donald Trump considers himself a member of the Republican Party. That's what he signed up for. He was recruited by Plus Ultra, so by definition he is Plus Ultra, but his own ideology started to split so significantly that he almost started a new political party in his thinking and has probably banished most of the people. Plus Ultra was founded on an ideal of optimism. We can accomplish anything if we set our minds to it. And yes, pessimism is out there. There is danger. There is violence. There is evil in the hearts of men. That said, we can overcome all of that. As the introductory film states, wars happen. So you have to acknowledge that, but you can say "we can learn from this and we can be better," or you can have the Nix philosophy, which is, "mankind is always inclined towards these things," and based on his speech at the end, he feels like certain individuals are not worthy of utopia. But then when you've seen the utopia that he's created for himself, it's very isolationist. It's not really the kind of place that Casey sees in her vision of Tomorrowland at its peak. I think Nix lacks the fundamental self-awareness to understand that his own negative thinking has created the very scenario that he wanted to avoid. Comparing Nix to Donald Trump is like comparing a planet to a potato. They're both kinda round but other than that they have no similarities. Same thing with Nix and Trump, they both might have done, and still are doing some bad things but other than that they have no similarities. I understand that people have different views on who Nix is but saying that he's like Trump is a bit over the top. And furthermore, Trump hasn't even been sworn in to office yet. Sure I don't like the guy either but could you at least wait until he does something wrong before comparing him to a villain?